This set comes with a really cute set of 3 pacifier clips from Baby Sonny. You get three (one with frogs and dragonflies, one with a fun colorful circle pattern, and one with elephants and monkeys). The colors and patterns are really vibrant and fun. There is a string on the end that you can use to attach to pacifiers or other toys or items. Really well made and keeps baby from dropping that pacifier. These make adorable shower gifts as well. I got my set to give as a gift and I can’t wait for the person I got them for to open them and see their reaction. Super super cute and high quality. CUTE FUN AND STYLISH DESIGN – Keep bubba’s dummy to hand and clean with our gorgeous pacifier clips. Your little one will love the animals and soft feeling of the leash and parents will love knowing that dummy is there when needed, no more unbearable crying whilst you search for a clean dummy!! STRONG & DURABLE – Our pacifier holders are made with high quality plastic clips that won’t pull off. The high end finish to stitching and the quality of textiles used result in an extremely well made clip that can be used until your little one no longer needs it. Couple that with the super soft leash that bubba will love!! 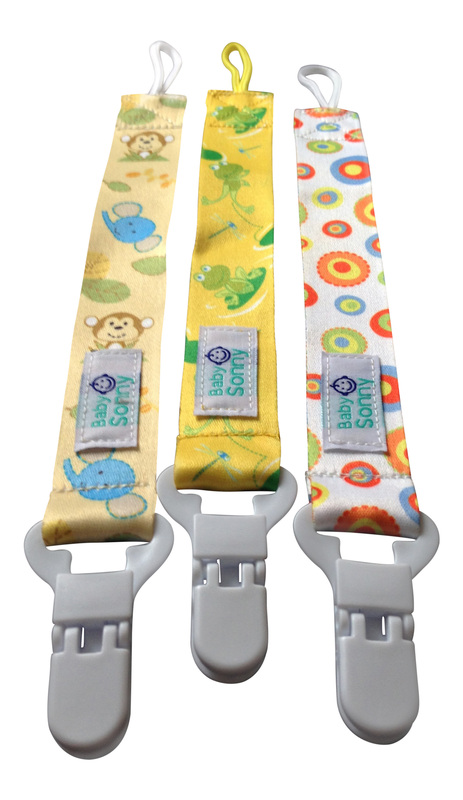 SUPER FUNCTIONAL – Baby Sonny pacifier clips are compliant with all dummy’s that have an attached ring and they also have a multitude of uses. Attach to bubba’s clothes and then to their teething products, soothers and favourite stuffed animals, so you can relax knowing they are where they need to be. You can also use them as a blanket clip for making sure baby stays covered up when out and about. PERFECT GIFT – Perfect gift choice for new Mums and Dads, cute yet functional, perfect for baby shower!! BACKED BY BABY SONNY GUARANTEE – We guarantee that you will love our pacifier clips, but if for whatever reason you aren’t 100% satisfied, return it within 90 days for a full refund, no questions asked.